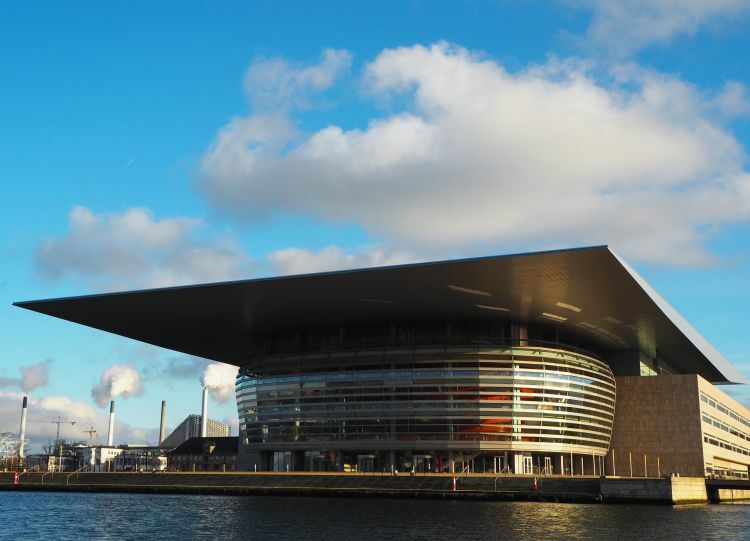 A surprise birthday trip at the end of November to the cool hip city of Copenhagen! 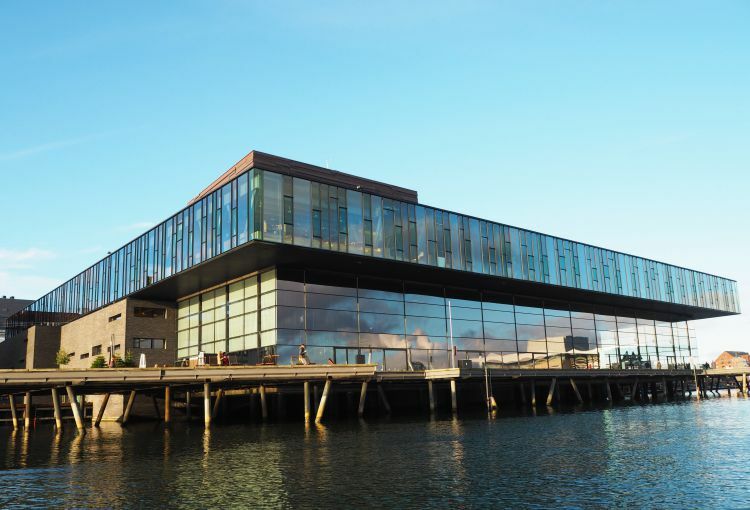 Copenhagen is the capital city of Denmark and is known as a green eco city, famous for its excellent quality of life, the arts and design, TV dramas and of course the Michelin starred restaurants. 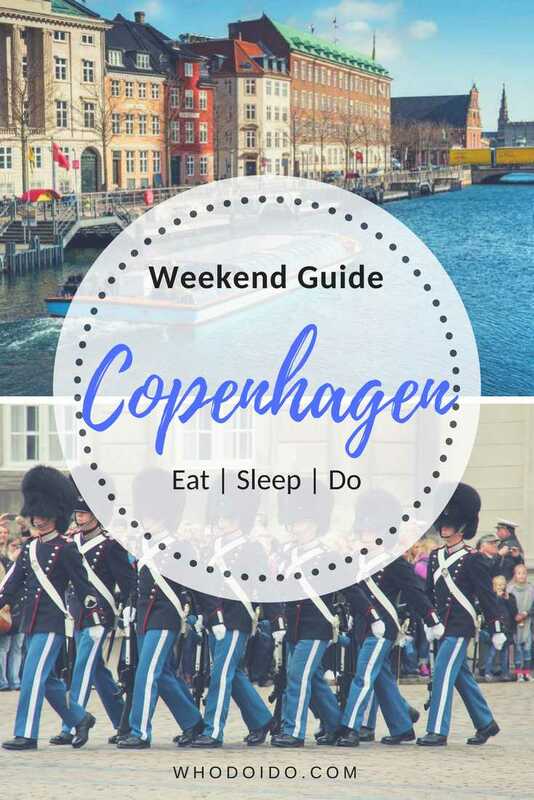 Copenhagen is only a short flight from many European cities, making this city easy to explore even if you only have a couple of days. Here you’ll find many cyclists whizzing around on their bikes, to and from work, to the shops or just for enjoyment and cycling is also one of the best ways to see the city’s attractions. 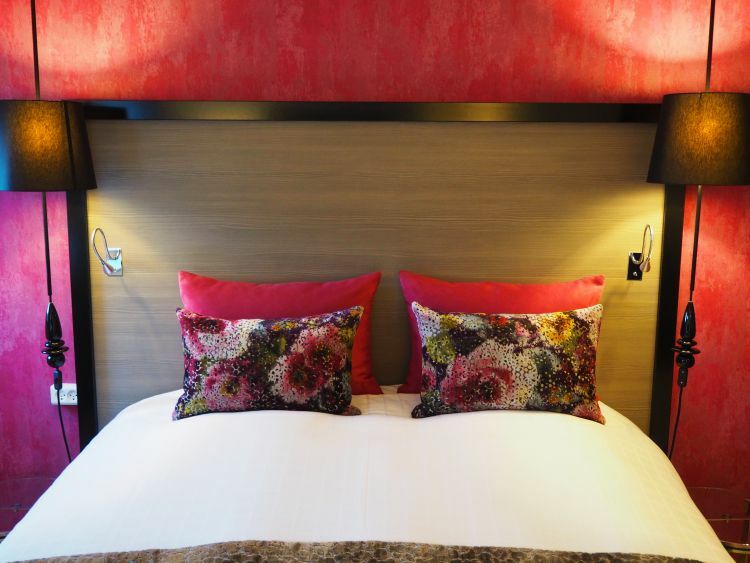 Each room at the Andersen hotel is uniquely designed and available in three colour schemes; purple, turquoise or blue and magenta. Our room was very bright and colourful with a view of the courtyard. One thing that tempted me to book this hotel was the ‘wine hour’ … did you hear right? Yes free wine for an hour (more than one glass each in our case) before heading out for the night. What a great way to experience ‘hygge’ – which more or less translates to ‘appreciating a moment or feeling, whether with company or alone, at home or out, either ordinary or extraordinary – as charming, cosy or special’. May I recommend that you use the stairs instead of the elevator at this hotel. You’ll find lovely treats on each level from cookies, toffees and cartons of water to keep you hydrated throughout your stay. 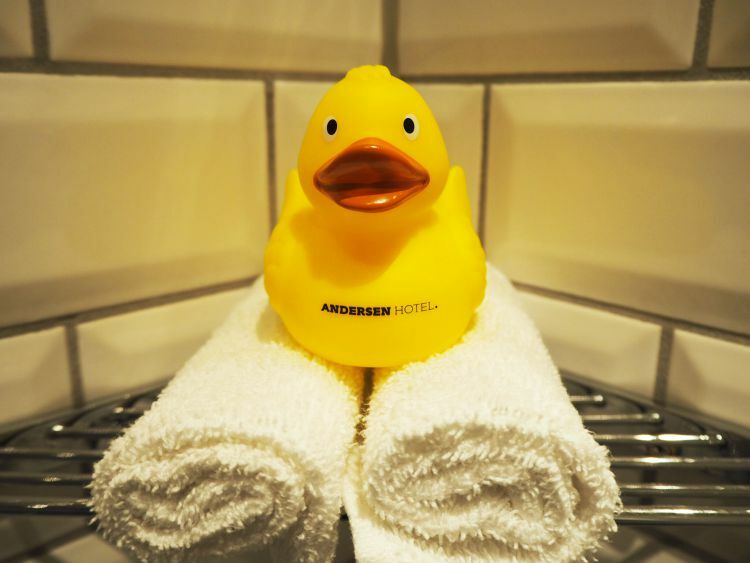 Check out booking.com for a great price on the Andersen Hotel. 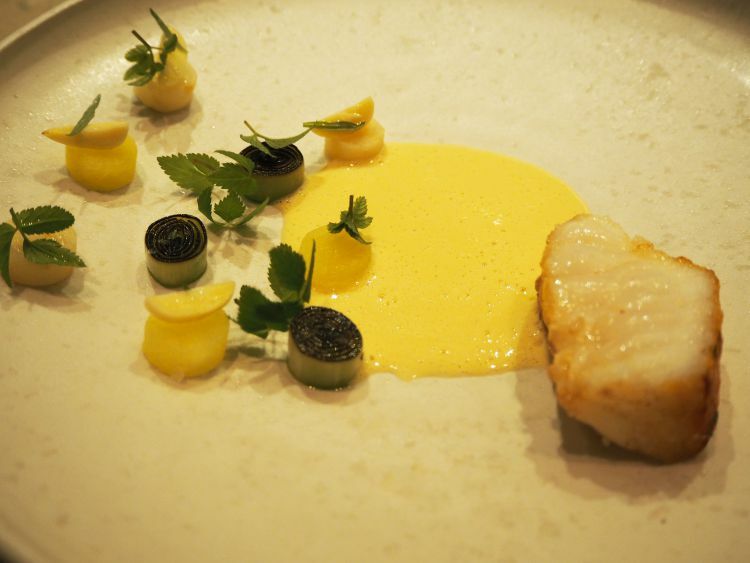 Every meal we had in Copenhagen was fantastic – truly a foodies paradise. 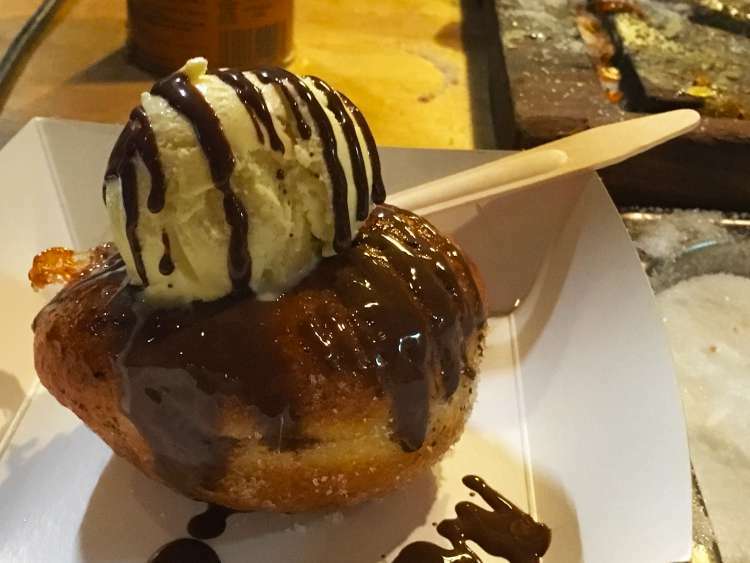 During our stay, we discovered great food from street food to Michelin star quality. 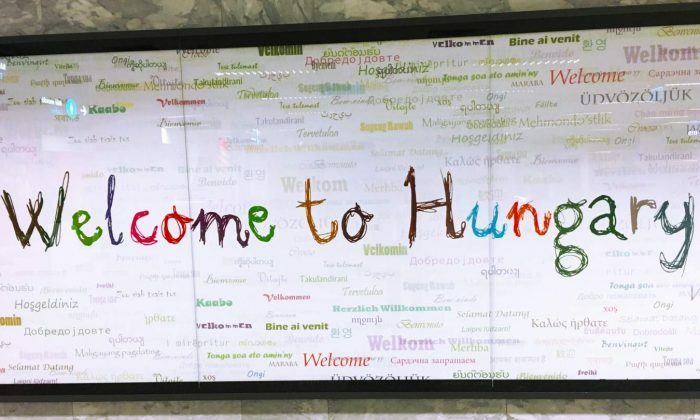 Check out below to find out where we ate. We stumbled across this cocktail bar which just so happen to sell organic pizzas and only two minutes from the hotel. The cocktails here were superb and the pizzas were not what we expected. 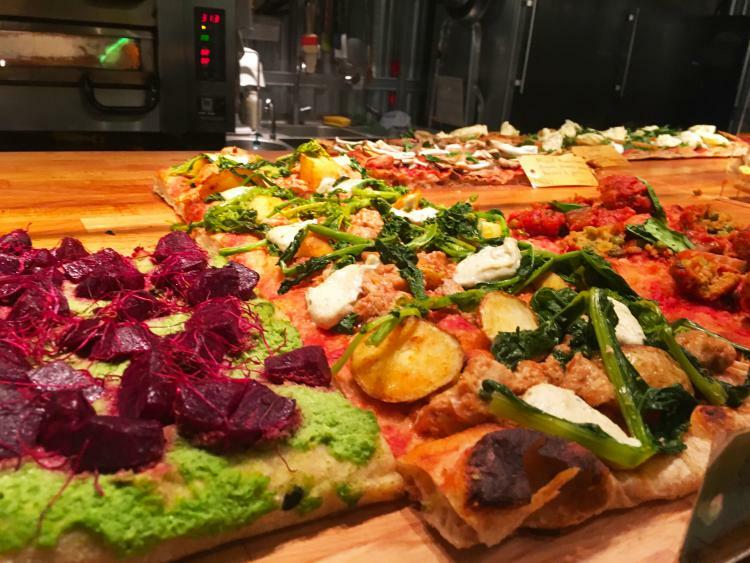 These pizzas had a super thin pizza base and were heavy on the toppings! We were loving this style of pizza. And definitely don’t leave without trying the desserts. 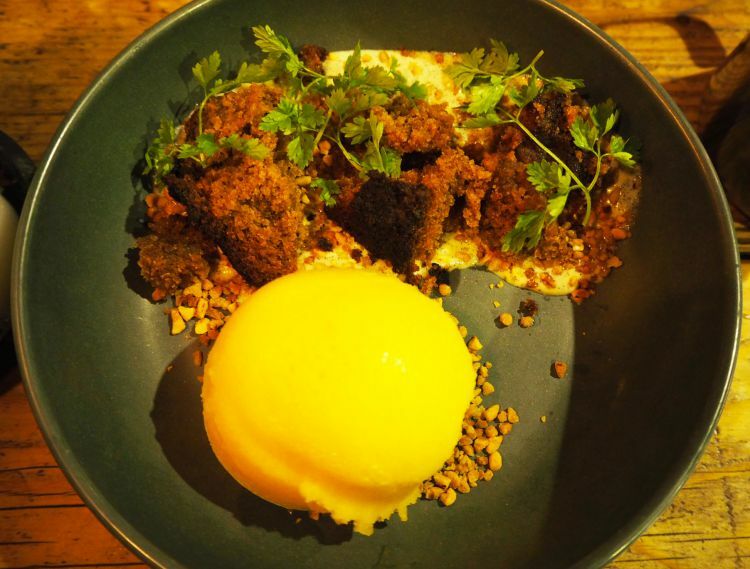 We had a deconstructed carrot cake to share – zesty sorbet served with a moist carrot cake. Yummy! Neighbourhood has such a chilled out vibe, dimly lit with long dark wooden benches for seating. 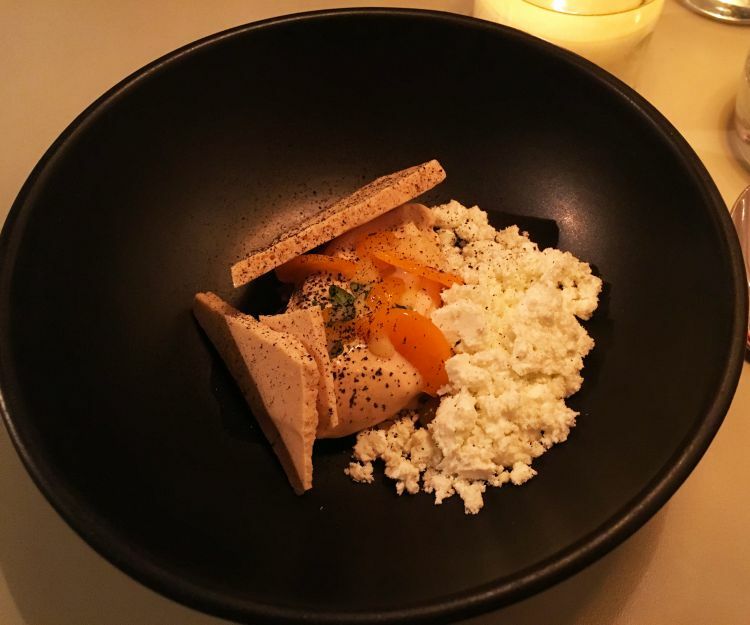 The menu changes fairly often and the restaurant even offers vegetarian and vegan options. 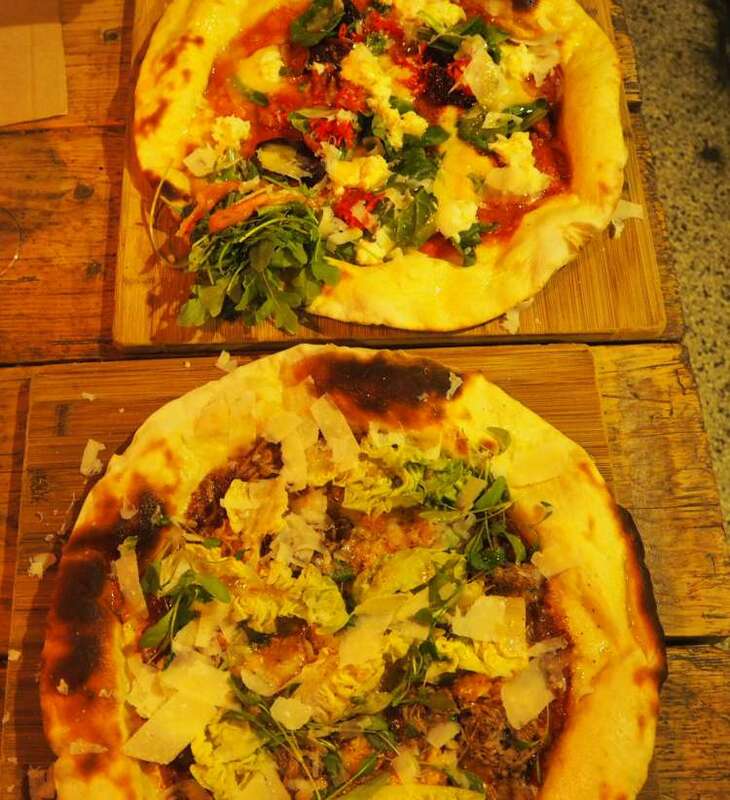 If you’re into the more sour dough type pizza, we heard the pizzas at ‘Mother’ were also very good. 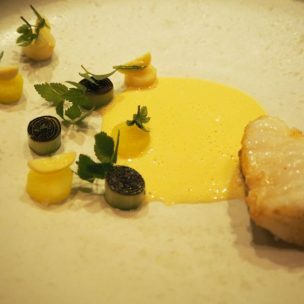 STUD!O is a one Michelin-starred restaurant located within the Standard, with beautiful views of the harbour front. 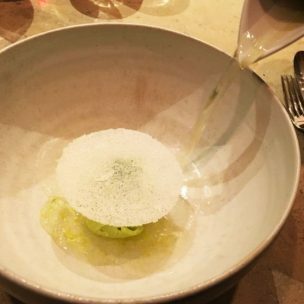 We highly recommend the kitchen experience, whereby you can watch the chefs utilise their skills to prepare each course. With the kitchen experience, we were seated around the open kitchen, which felt really relaxed. 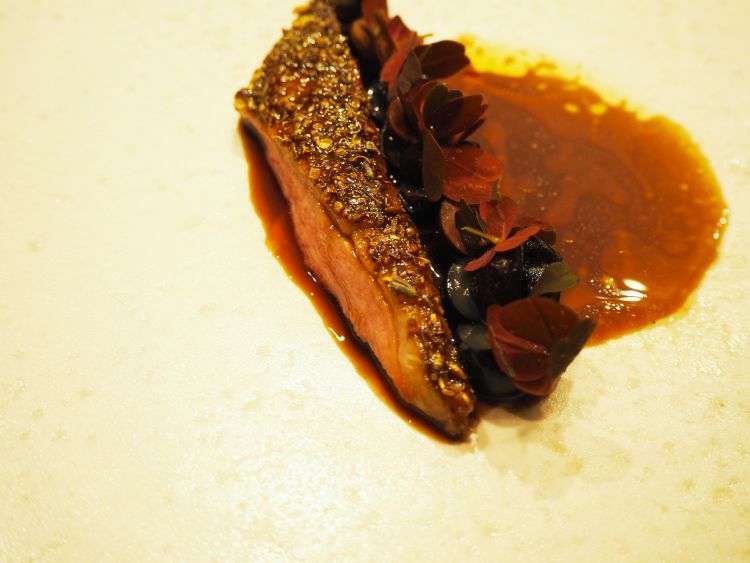 It was great watching the chefs carve the duck breast and present each plate like a work of art. We were able to strike up conversations with chefs at any time while they were working and picked up a few tips. I couldn’t say which course was my favourite, because they all were. The flavours were intense and like tiny explosions in the mouth. 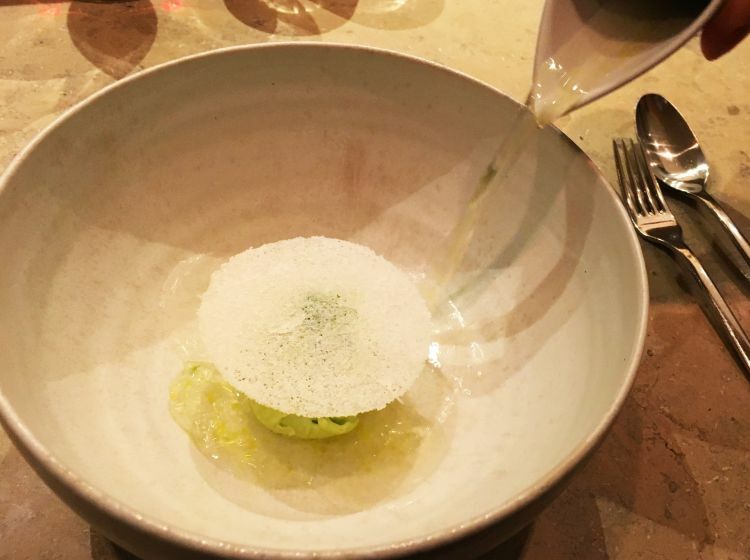 When perusing the internet for Ian’s surprise birthday meal, the kitchen experience at STUD!O was affordable compared to the rest of the Michelin starred restaurants in Copenhagen. Oh and double check the price for the wine. Ian misread the price and our two glasses of red cost the same as our meal. Oops! Book here for that special occasion! What a great find this was! 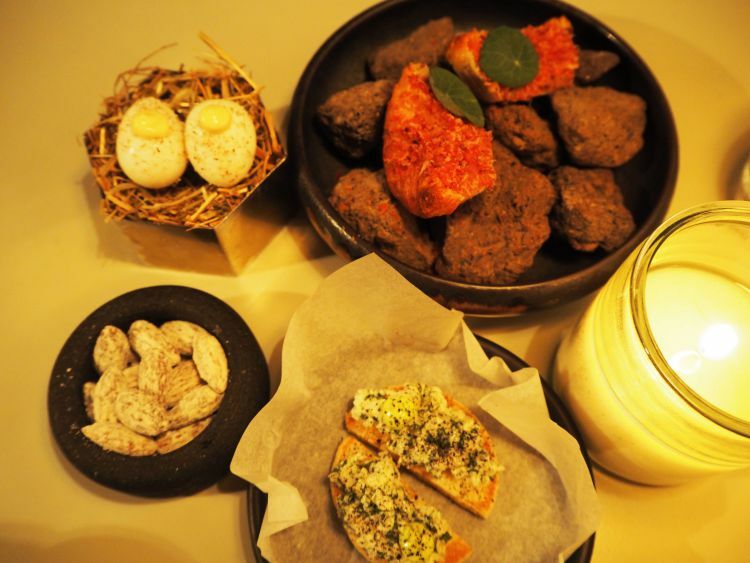 Bodil is a small cosy restaurant located in what used to be a residential building. We ended up ordering a taxi to ensure we got there on time. There was a set 4 course evening meal offered and each course was super tasty leaving nothing to fault. Definitely order the snacks to get your taste buds going! 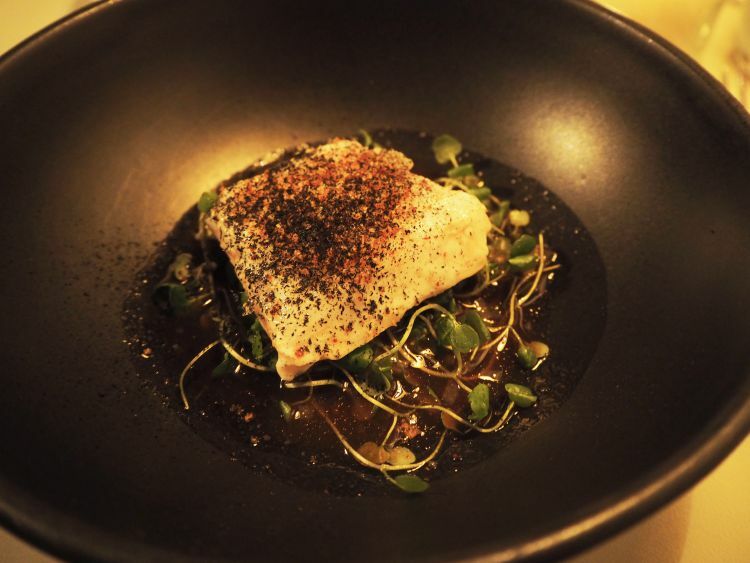 The beautifully cooked halibut and the beef tartar were outstanding and packed full of flavour. Oh and the dessert was to die for! The pine snow melted in my mouth. You’ll need to reserve a table here to avoid disappointment. 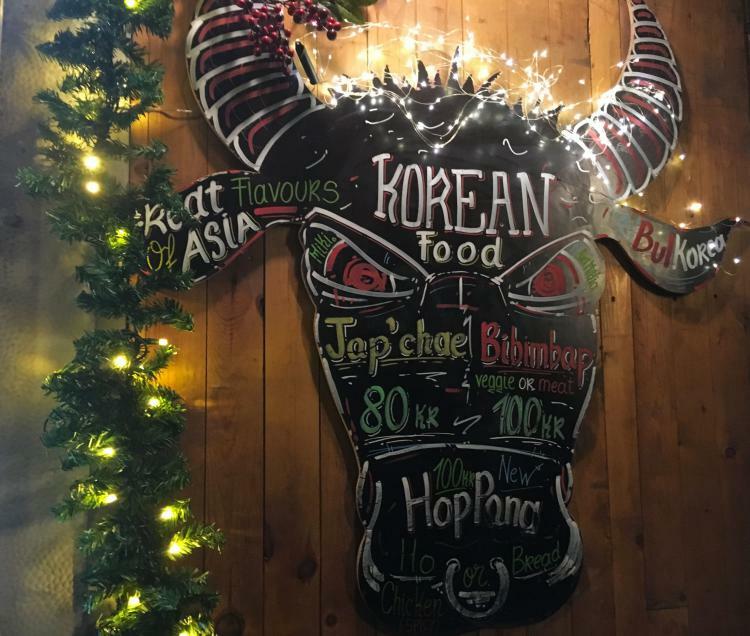 We ventured towards Paper Island on our first night and after walking around the stalls at least three times, we decided on sampling the Korean street food stall. Oh wow! I have never tasted such pillowy buns accompanied with spicy chicken. 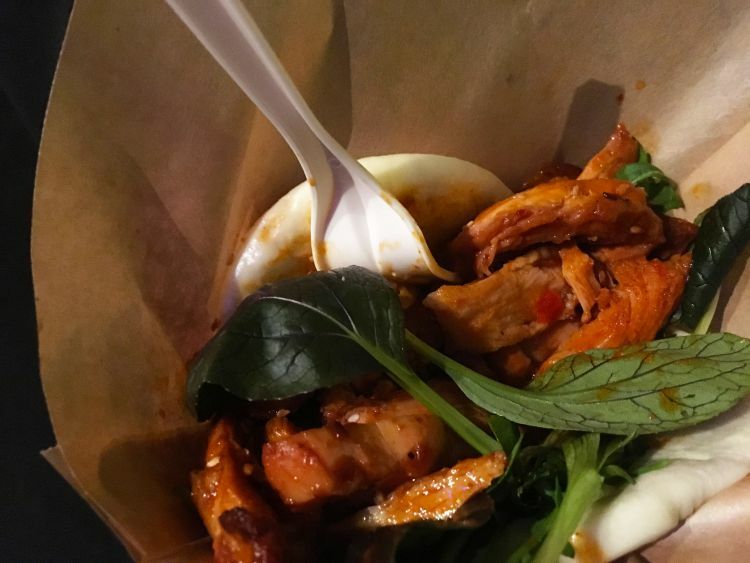 Since Paper Island has closed its doors, there are other indoor food markets and street food markets to explore, such as Torvehallerne and WestMarket. 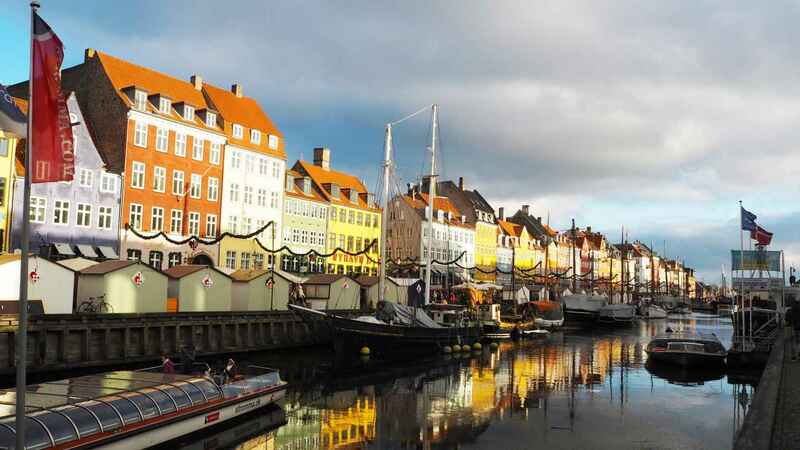 Nyhavn is a charming waterfront and canalside district lined with numerous restaurants, cafés and bars, attracting many tourists to take the perfect postcard picture. You’ve probably seen the colourful townhouse buildings along this canal many times, with various boats moored in the harbour, from Instagram. Nyhavn is a very instagram worthy spot! 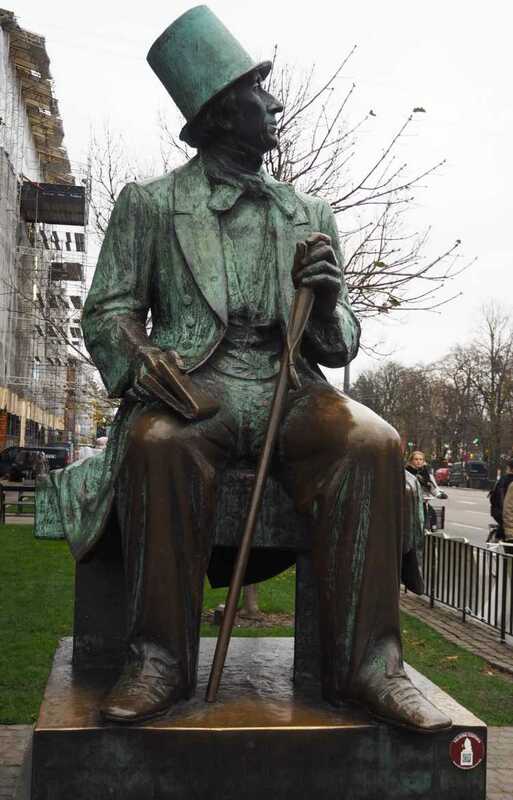 Did you know that Hans Christian Andersen lived at various times at No.67, N0.18 and also No.20 where he wrote some of his first fairy tales ‘The Tinderbox’, ‘Little Claus and Big Claus’, ‘Little Idas Flowers’ and ‘The Princess and the Pea’. This is the perfect setting in the Summer, to enjoy a glass of wine or beer, listen to some music and watch the world go by. 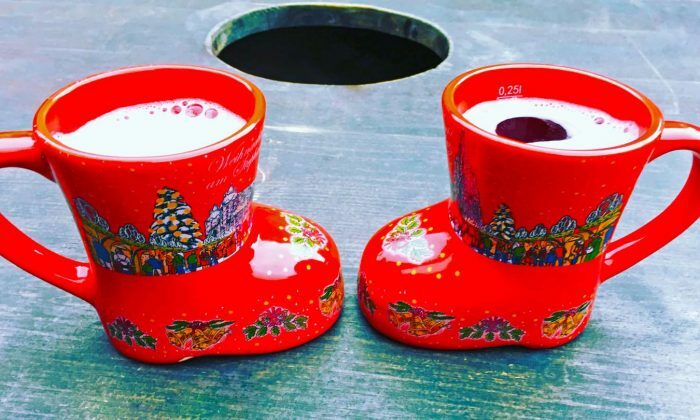 In the Winter, it can be chilly, however we noticed there were heaters and blankets provided by the restaurants or just warm yourself up with a glass or two of ‘gløgg’ at some of the little Christmas Market Stalls pitched along the canalside. 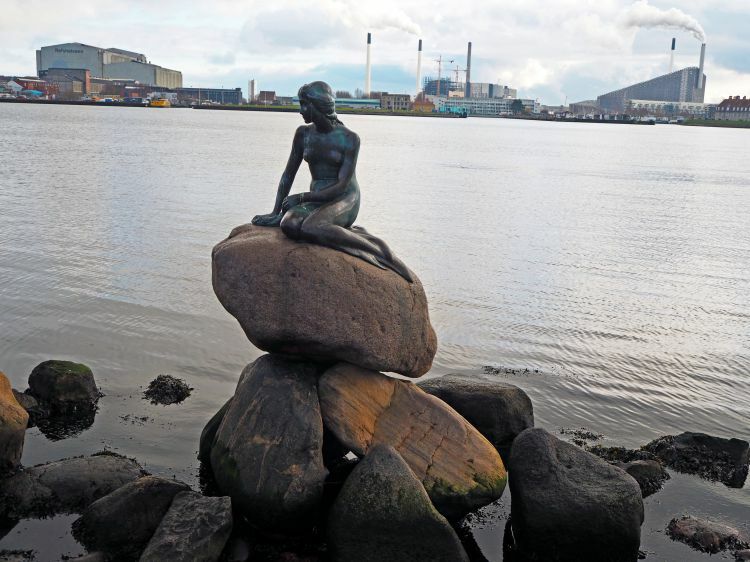 The Little Mermaid aka ‘Den lille havfrue’ is the iconic symbol of Copenhagen. The bronze sculpture sits on a large granite boulder in Langelinie Pier looking out to the shore. 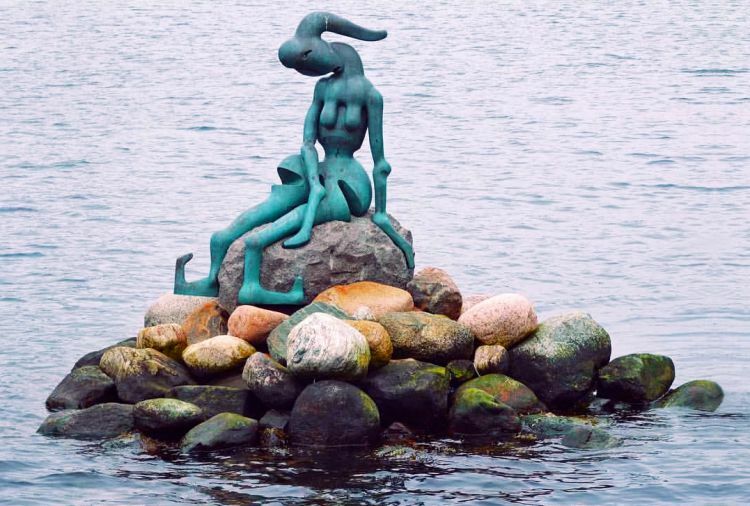 This famous statue is based on a fairy tale by Hans Christian Andersen; it tells a tale of how the mermaid saves the prince from drowning in the sea and falls in love with him. To transform into a human being, she exchanges her voice for a pair of legs and has three days to receive a kiss from the prince. However, the tale ends tragically as the prince doesn’t recognise her and she turns into sea foam. Surprisingly we were underwhelmed with the little mermaid – somehow I expected it to be bigger maybe. However, it still attracts coaches full of tourists everyday. The sculpture has been a victim of vandalism over the years. She’s lost her head twice, had her arm cut off and even had paint thrown over her. Tip: Walk north along the harbour and you’ll spot ‘The Ugly Sister’ statue a few hundred metres from the Little Mermaid. The Ugly Sister is located in The Genetically Modified Paradise. 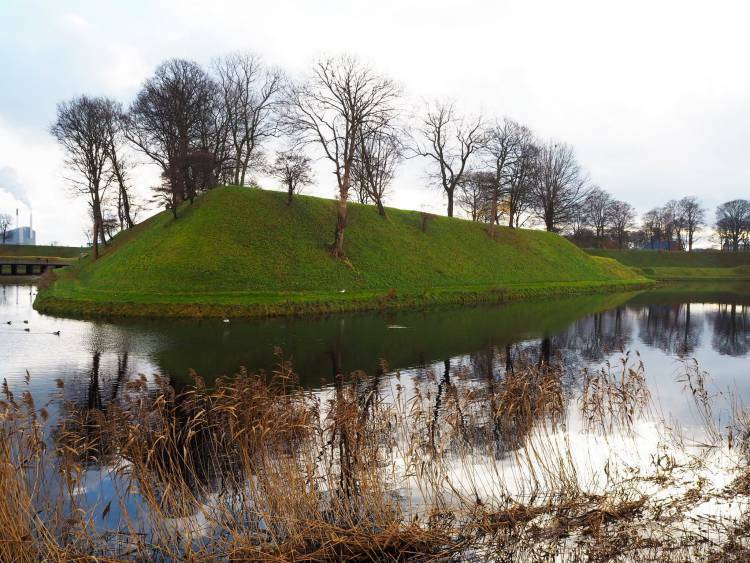 The Citadel is a short walk from Østerport station and is surrounded by ramparts and leafy scenery. Perfect for a leisurely stroll around the ramparts or even a jog. So quiet and picturesque here, you couldn’t tell you were still in the city. Walk around the ramparts before making your way to see The Little Mermaid. The palace consists of four identical Rococo palaces; Frederik VIII’s Palace, Christian VII’s Palace, Christian VIII’s Palace and Christian IX’s Palace. 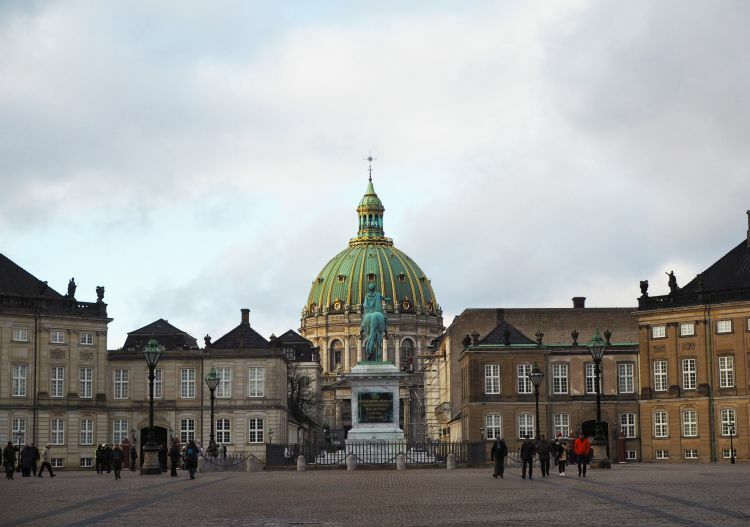 As you head towards the Amalienborg Palace, you’ll notice that the identical palaces are located around a courtyard with a statue of King Frederik V in the centre. You can visit the Amalienborg museum which exhibits the recent royal history. The Royal Family still reside at Amalienborg Palace. Don’t forget to watch the changing of The Royal Guard in the court yard, which occurs everyday. Aim to be at the Amalienborg Palace at noon. 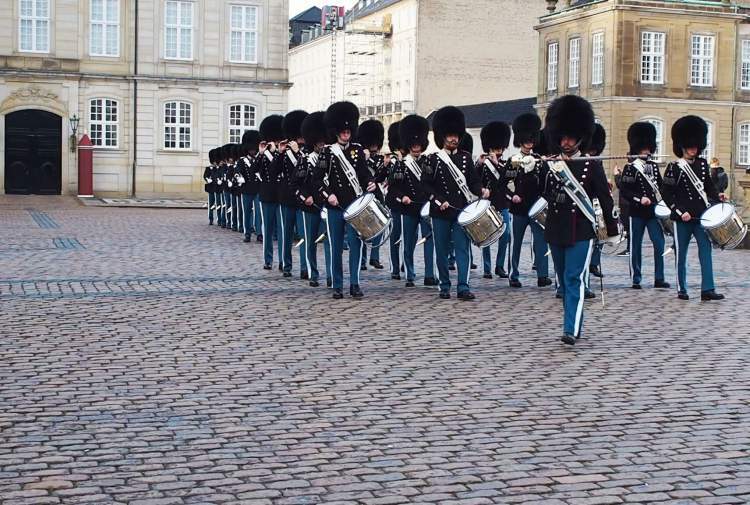 It’s great to see the guards dressed in their blue uniforms and bearskin hats. 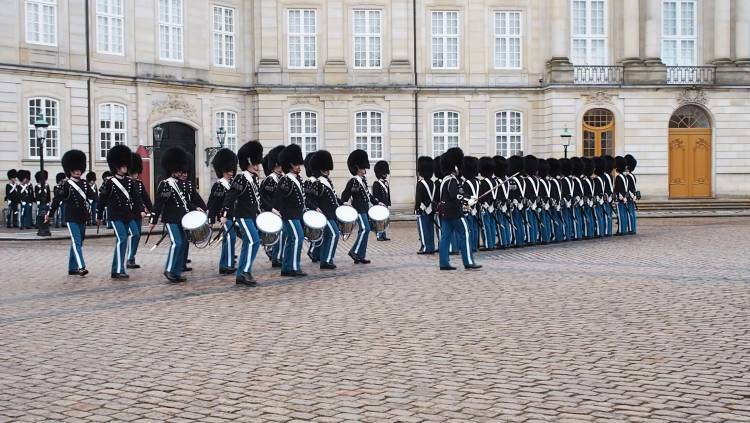 The guards march everyday through the streets of Copenhagen from the barracks at Rosenborg Castle to Amalienborg. We thought we had missed the changing of the guards as we arrived at 12.25pm, but got there just in the nick of time as we saw the guards arrive into the courtyard. Phew! Located in the inner city you’ll find a 42m high round tower, which has an operational observatory right at the top of the tower. 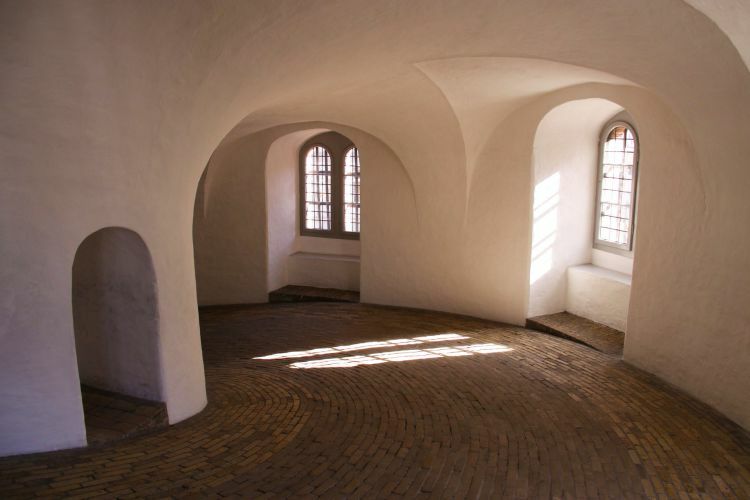 Walk along the spiral cobbled ramp within the tower and half way up there’s an art gallery, with a small café inside, if you need to catch your breath. Continue your way up and you’ll come across a spiral staircase, which will take you to the top of the tower. 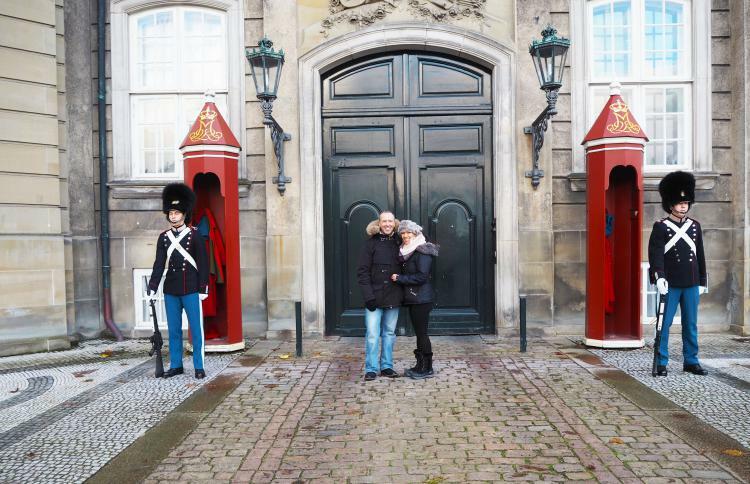 Here, you can capture fantastic views across the city and you might be able to catch the guards walking through the streets making their way to Amalionborg Palace. For those who are brave, try standing on the floating glass floor. The glass floor is 25m above ground within the core of the tower. Don’t fret, the glass floor can carry a hefty load of 900kg per square meter and is over 50mm think. And yes I had to try it! The scent of the hot dogs drew us to the DØP hot dog stand, which happened to be next to the Round Tower. Now these hot dogs are all organic and you can choose to have it in a sourdough roll or with mashed roots. In a roll for me and Ian please! I chose the ‘Roasted hot dog’; a traditional hot dog with ketchup, mustard, fried onions and pickles. 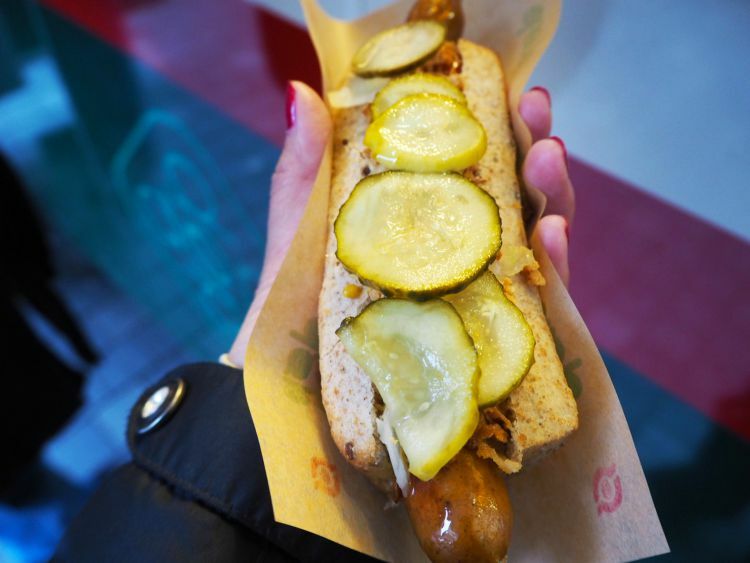 Ian was more adventurous and requested the pork sausage with garlic in his hot dog for an extra 5 DKK. Oh my these hot dogs were good and filled an empty gap. 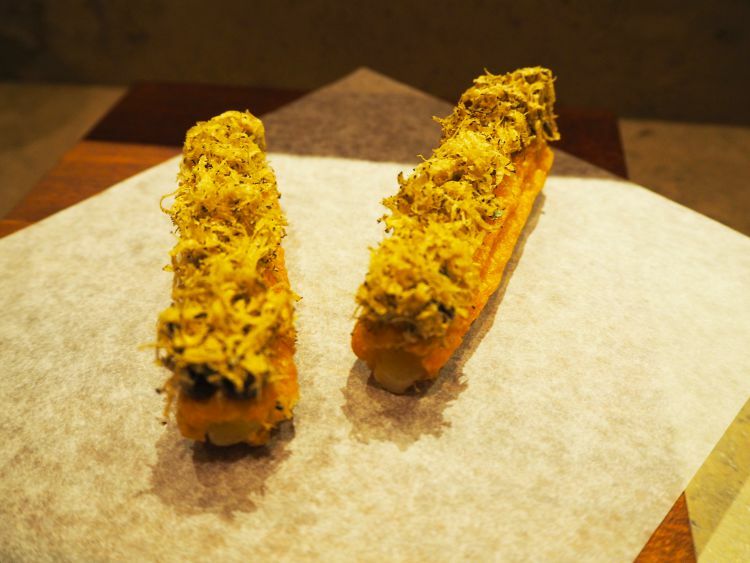 For the veggies, you can opt for the veggie hot dog. We highly recommend trying the hot dogs there. 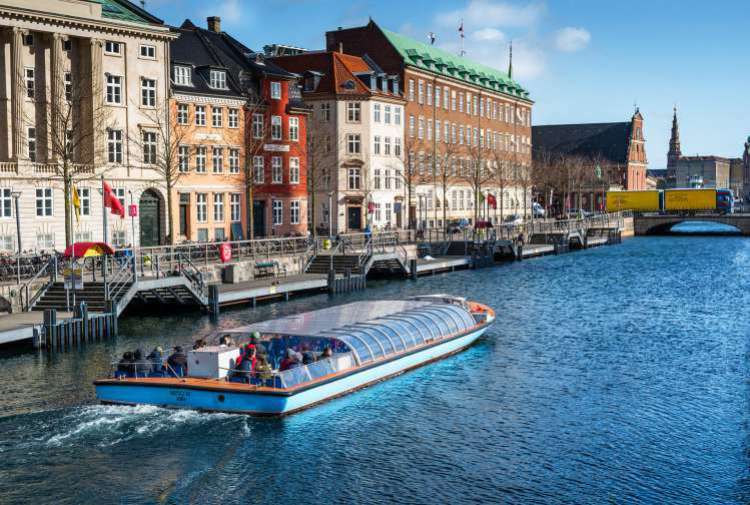 Why not see the city from a different perspective and take a boat ride to enjoy the sights of Copenhagen. 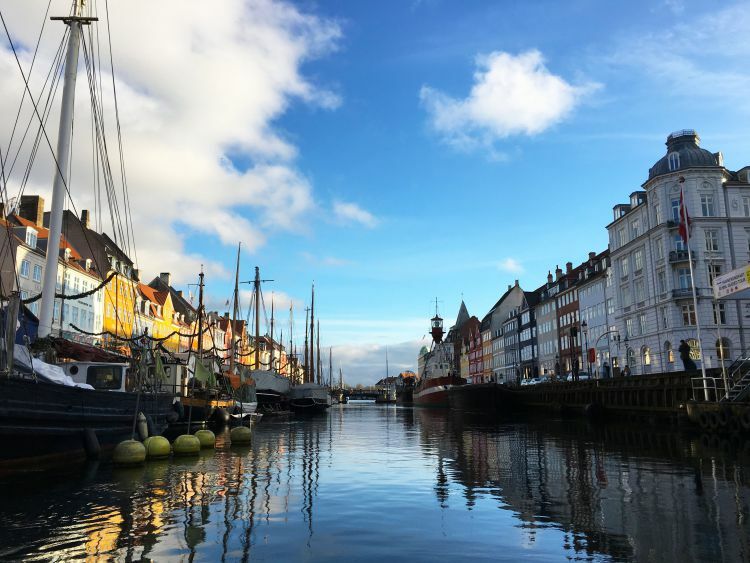 Pick up a blue Netto boat from Nyhavn and cruise through the pretty canals, passing the The Little Mermaid, Our Saviour’s Church, Amalionborg Palace, Christianshavn’s Canal, Nyholm, Holmen and Frederiksholm. The boat makes a stop at Holmens Church to pick up other passengers and drops you off if you fancied a wander. The boat tour lasts for an hour. It’s chilly during the winter months, but if you can brave the cold then sit at the rear of the boat for the best views. The boat does have a glass roof for those who don’t wish to sit outside, however we noticed the roof was a bit scratched and offers partial clear views. Price: 8€ for an adult and 3€ for a child. Take a stroll through the preened King’s Garden – one of the oldest parks in Copenhagen. 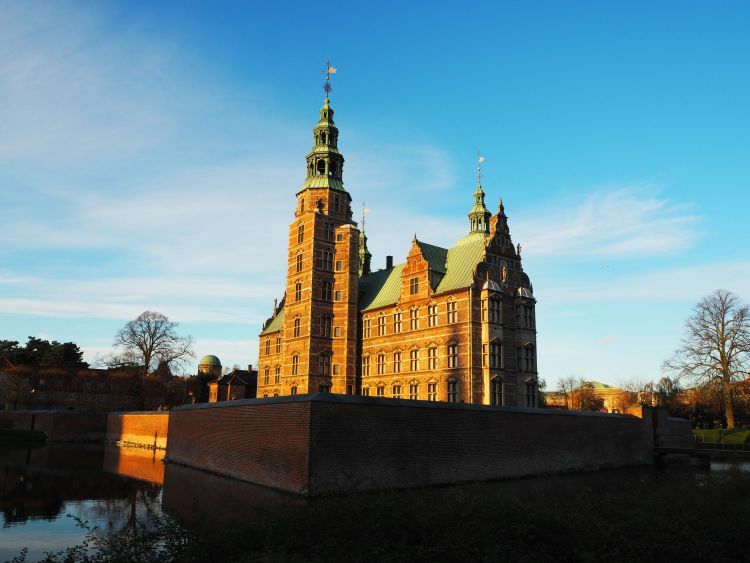 The Rosenborg Castle sits in the King’s Garden; a beautiful red bricked castle which stands tall with fairy tale towers and spires. The castle houses the Crown Jewels and the royal art treasures – this castle definitely is regal. Tip: Snap the perfect sunset and sunrise picture here. Price: It’s free to walk around the King’s Garden but to view the 6 museums the ticket is 195 DKK. Everyone who we’ve known advised us to visit Tivoli. When we first saw Tivoli, it just resembled another amusement park. I thought what’s so good about it? But it’s much more than an amusement park. Here you’ll find restaurants, hotel, food and drink stalls, and of course the adrenaline rush rides in the amusement park. 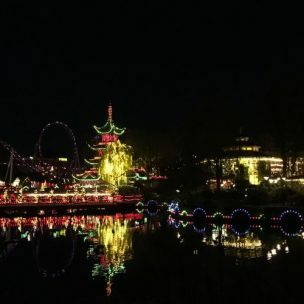 We decided to head to Tivoli Gardens after our meal at Bodil, considering it was our last night and end our trip on a high. 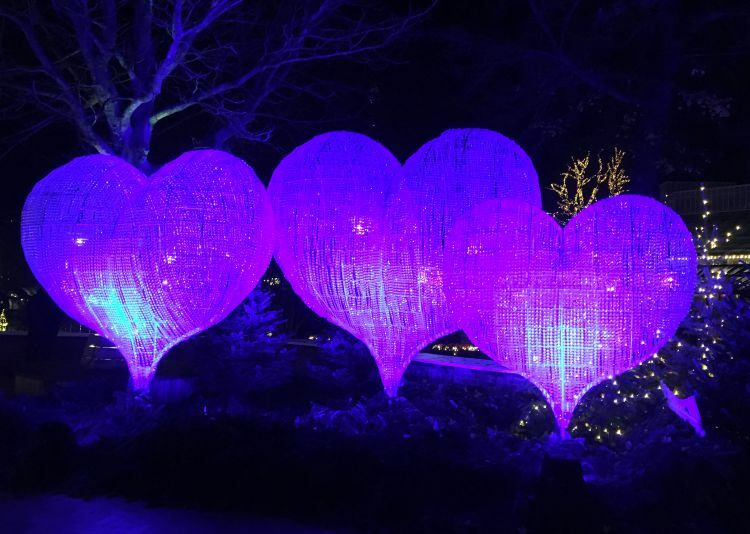 At night, everything is lit up – all the bright coloured lights of the rollercoaster rides, the illuminated gardens, flower displays and the buildings. Shame we had eaten, otherwise I would be sampling all the food on offer. We have to admit, that it’s quite pricey … you pay for the entrance ticket and you have the option to pay for the rides individually or purchase an unlimited ticket ride. We opted for paying the rides individually. 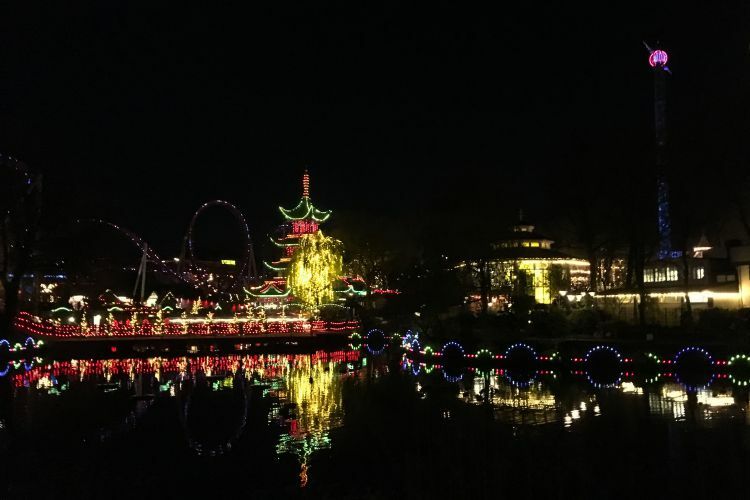 Tip: Tivoli gardens is open on specific months. 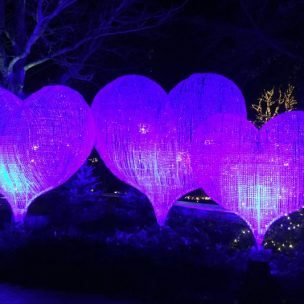 Remember to check the opening times on the Tivoli Garden website. Strøget is Copenhagen’s main pedestrianised shopping street running from Rådhuspladsen all the way to Kongens Nytorv, over 1km long. Here you’ll find high street boutique to high end shops intermingled with live music from the buskers to keep your entertained. 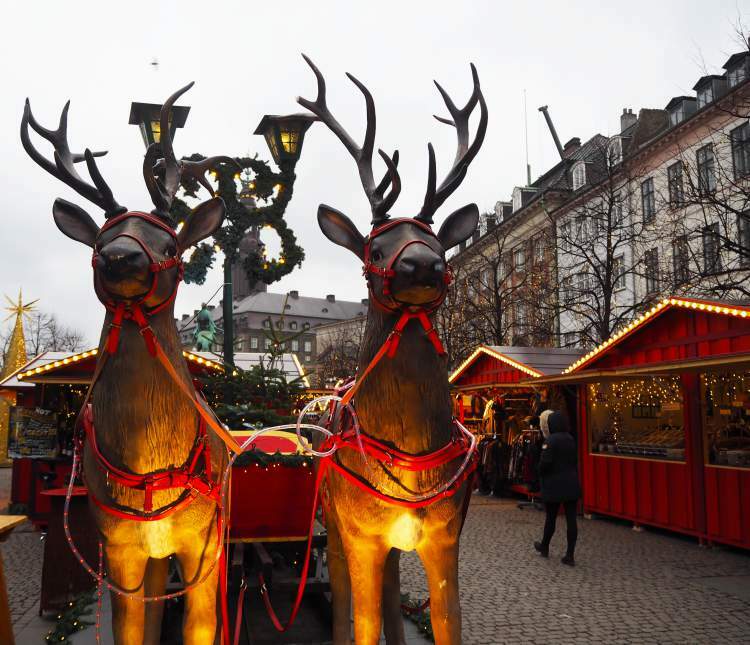 Visiting the city before Christmas, we warmed ourselves up with a cup of ‘gløgg’ and the various Christmas Market stalls will try and tempt you with their varied assortment of sweet treats! We heard quite a bit about Christiania prior to our visit and it is a popular sight to visit amongst the tourists. Freetown Christiania started with a bunch of homeless occupying the army barracks. Nowadays, it has a relaxed, kinda hippy, whacky look with the residents building some unique homes. One of the rules is that photography is forbidden. Probably due to the cannabis being traded openly there. 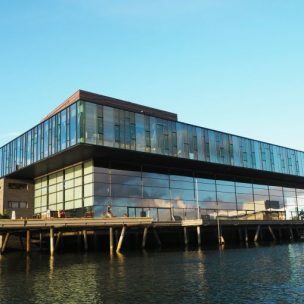 A definite must see to have a peek at an alternative Copenhagen. This is one thing we didn’t do in Copenhagen as it was a wee bit cold to ride the bike and I didn’t fancy the rain being blown across our faces. If it had been warmer, it would have been ideal to see the sights and not spend any money on public transport. Plus you could ride with the locals in the fast lane! It’s perfectly safe and the cycle lanes look quite wide. We even saw a few locals wear helmets. Remember safety comes first. 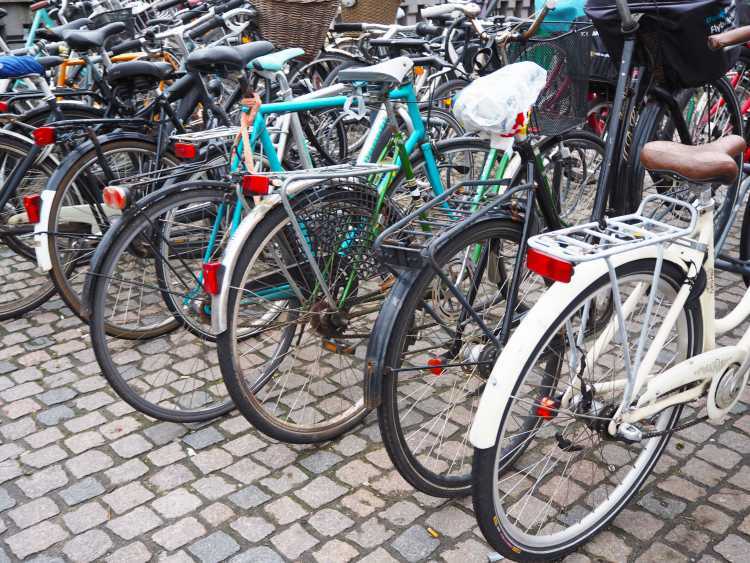 Bikes can be rented via your hotel. 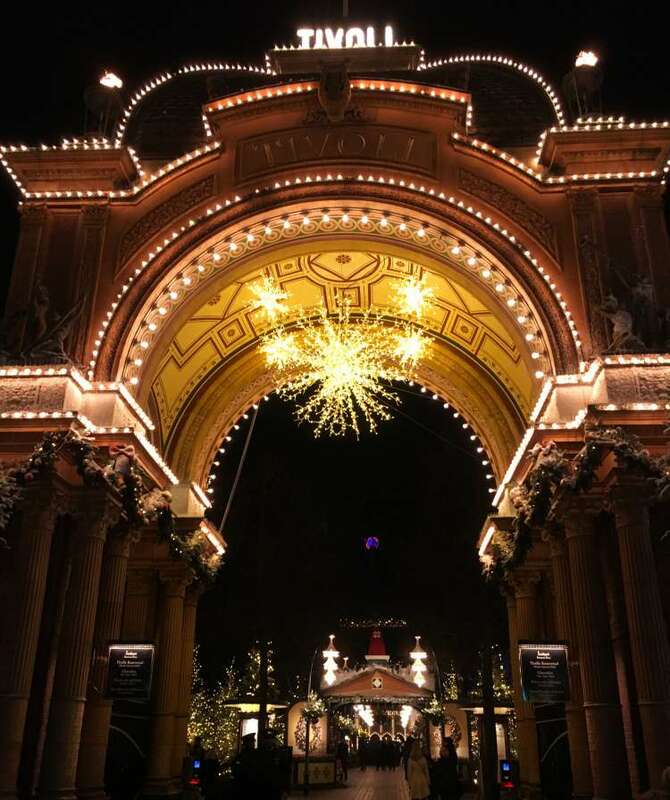 If you happen to be in Copenhagen around Christmas time, then wander around the many Christmas Markets within the city. 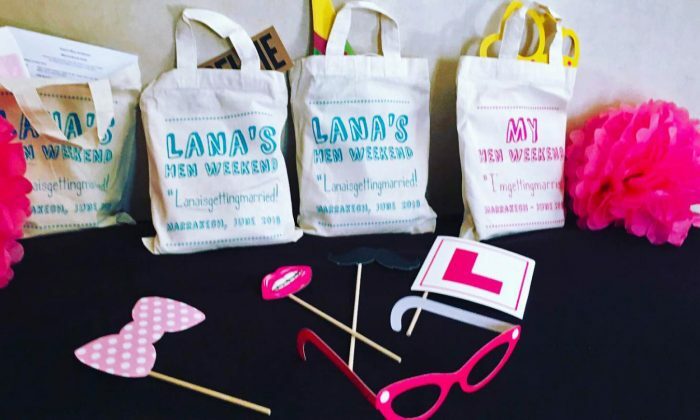 You’ll find many knick-knacks, souvenirs, sweet treats, food and drink stalls. 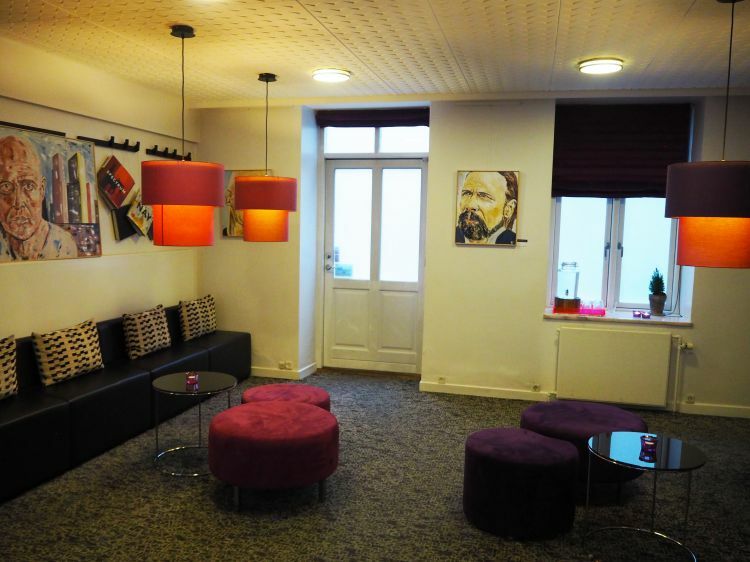 Don’t forget to try ‘gløgg’ (a quite strong Danish version of mulled wine) which’ll warm you up while you browse. 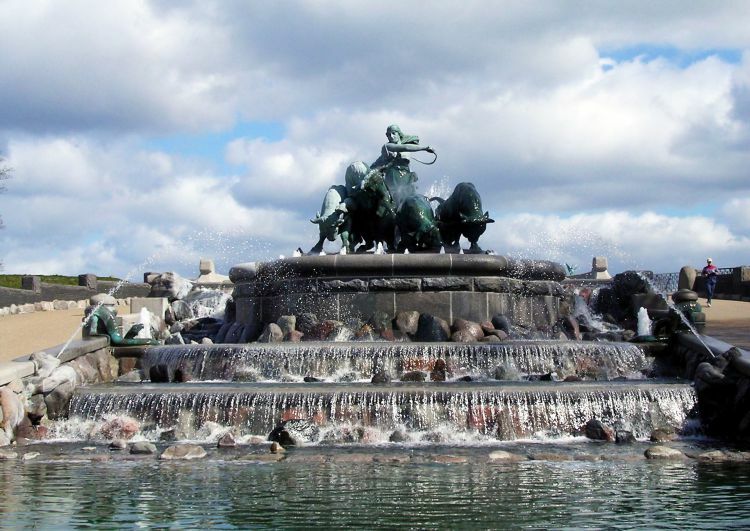 Why not pop over to Sweden and explore Malmö. 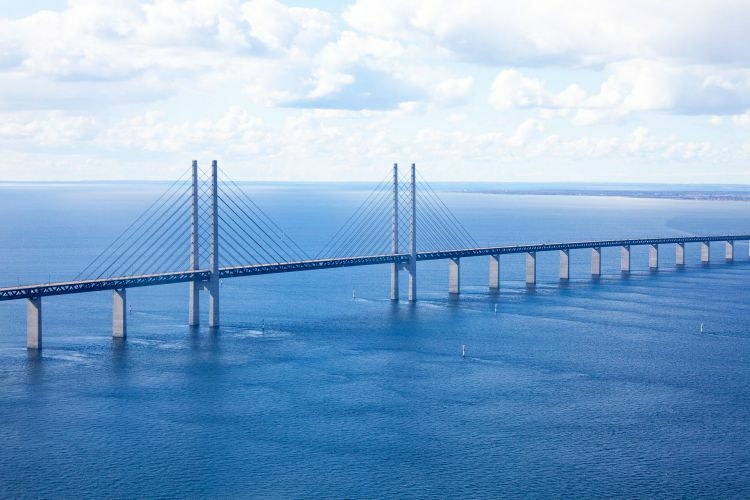 Literally it’s just across the water from Copenhagen and there’s frequent trains from Central station which will take you over Öresund Bridge to Malmö. We didn’t purchase the Copenhagen Card. The city is very accessible by foot and we only used the train to reach the Little Mermaid. Also exploring Copenhagen by bike is a great way with so many cycle lanes in the city. 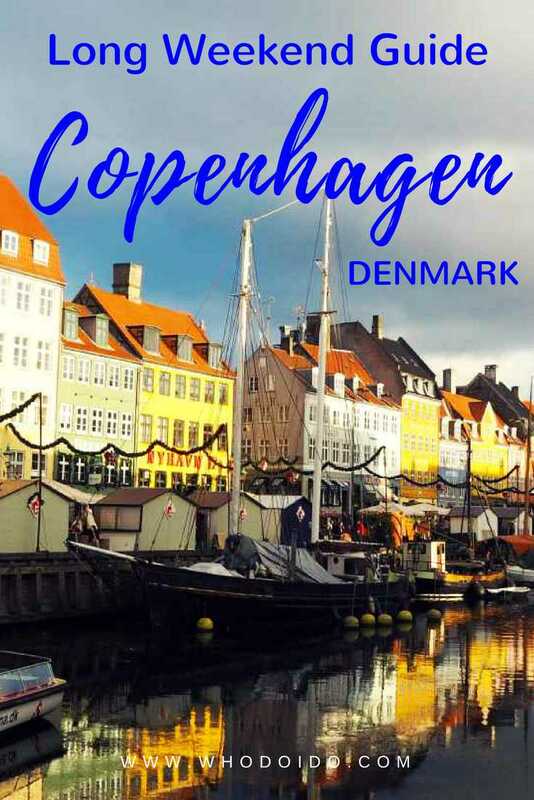 However, if you wish to visit the museums then the Copenhagen Card might be ideal and it also allows you free public transport and free entry to quite a few attractions, for example The Round Tower and the Canal Tour. Tap water is safe to drink. Fill your water bottle with the tap water to keep you hydrated whilst exploring the city. 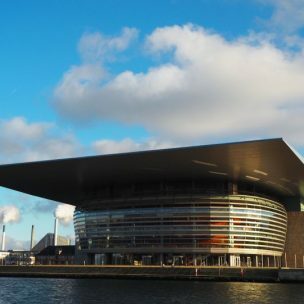 Flights from the UK to Copenhagen are around two hours with many budget airlines flying there. 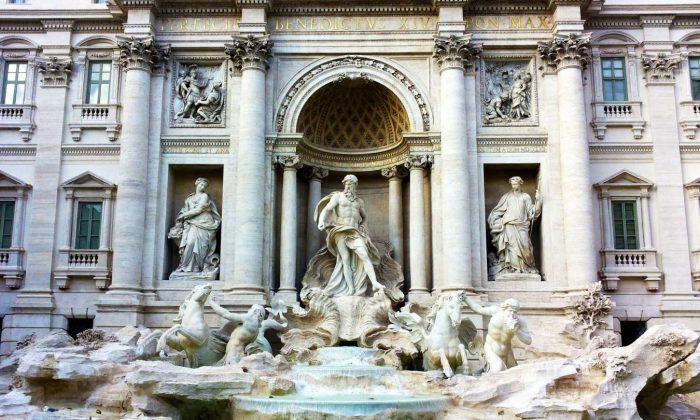 We flew with Ryanair for less than £100 return at the end of November. For the best prices on flights, search here. 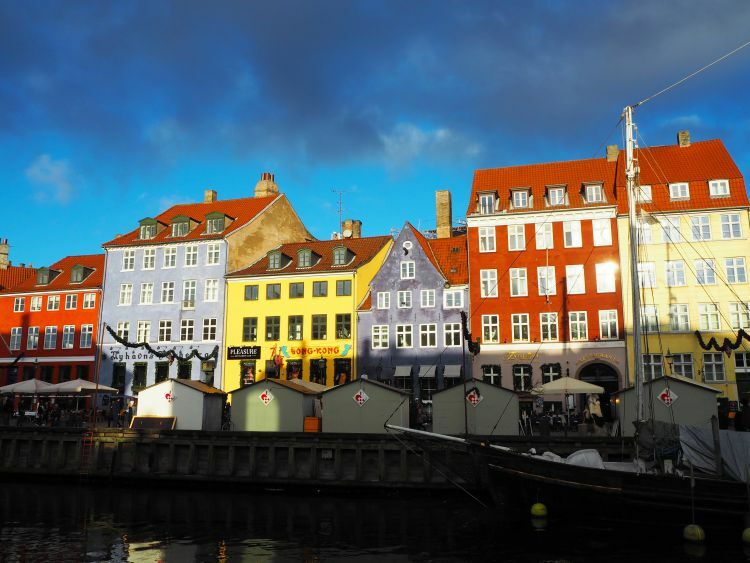 Have you visited Copenhagen? What did you enjoy most from your trip? I have been there, its a great place to visit. Amazing photos! Such a great post, looks like a great place to vacation. It is really lovely and very easy to get around Cristina. You definitely should go visit! The hot dogs look….amazing. And the fact that they’re all organic! Also, the ugly sister sculpture was surprising, I never knew it existed until now! Copenhagen is super close to me (I live in Edinburgh) but still haven’t hit it yet! 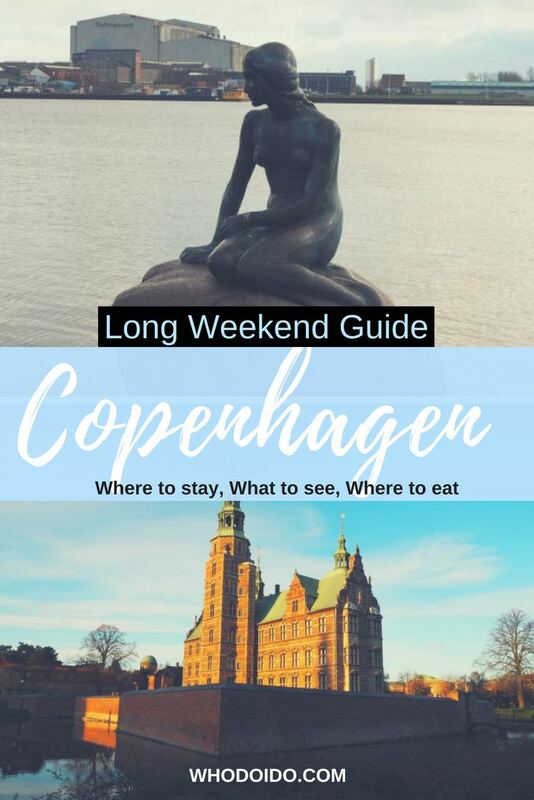 I began reading and thought Copenhagen seems like a nice place to visit…and then I read foodies paradise and saw those food pictures and now I think Copenhagen seems like a really amazing place to visit! I mean I’ll go for the experience, history, architecture and touristy sights but we both know I’d only be going for the food! Great post Lana, such a wonderful surprise for Ian! ‘…use the stairs instead of the elevator at this hotel. You’ll find lovely treats…’ LOL. This is the the best tips ever. And it looks like Copenhagen is a mecca for foodie like myself. 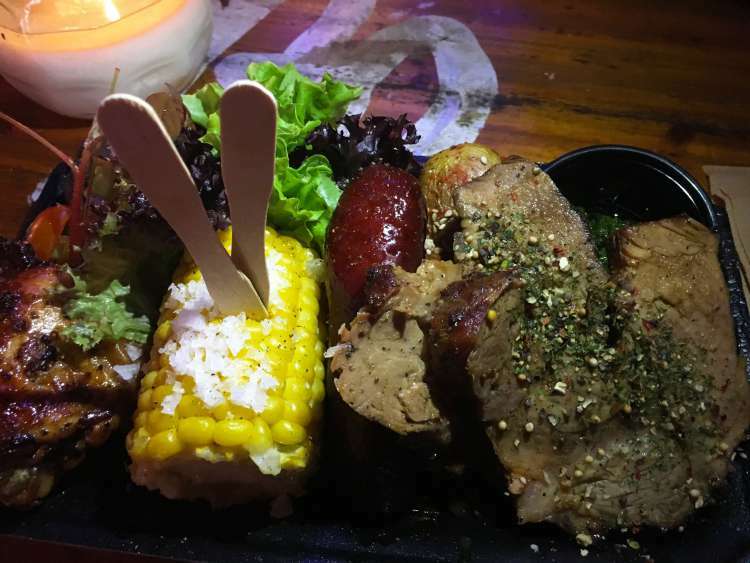 I love modern cuisine and street food too. While ‘The Little Mermaid’ is known world-wide, this is the first time I’ve heard about her ‘ugly’ sister, and I think she’s adorable. Very Picasso-like. You had me at ‘wine hour’…. the Andersen hotel it is when I make my way to Copenhagen. The itinerary looks awesome and some of the photographs, like those waterfront pics look truly amazing. What a fun birthday surprise! I would love to visit Denmark someday! That hotel sounds amazing. Wine hour and treats for taking the stairs! Yes please! I just adore travel so much but I don’t think I have ever been to Copenhagen. I have been to Denmark though, ha! Why the heck did I miss this city is beyond me! Wine hour is a must. I wish all hotels had this!!! 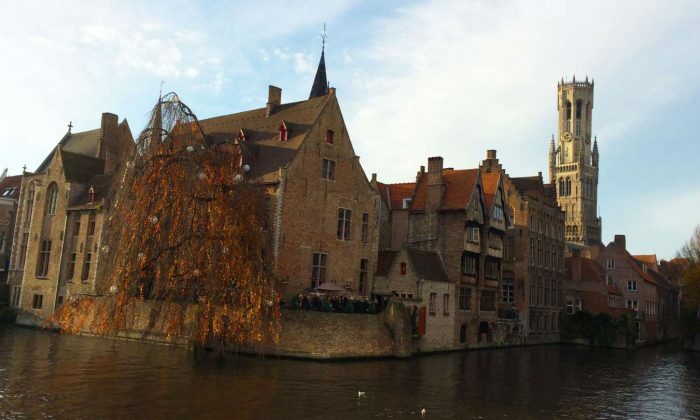 The photos are amazing and it looks such a beautiful city but if I’m honest you had me at “wine hour”…. 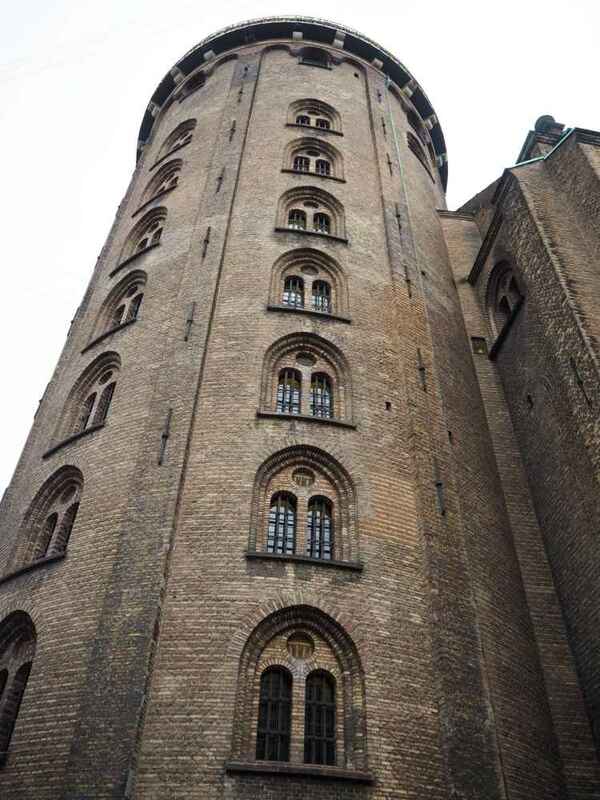 Copenhagen is high up on my bucket list – it seems like such a cool place to visit! The canal tour looks like a lovely way to see the city. I’ve always wanted to go to ‘wonderful wonderful’ Copenhagen. Sounds like you had a wonderful trip. Will definitely have to get around to it soon. Yes it certainly was wonderful! 😉 Hope you get the chance to visit Copenhagen soon!